Europe Air Source Heat Pump Market size was valued over USD 5 billion in 2017 with annual deployment to exceed 1 million units by 2024. 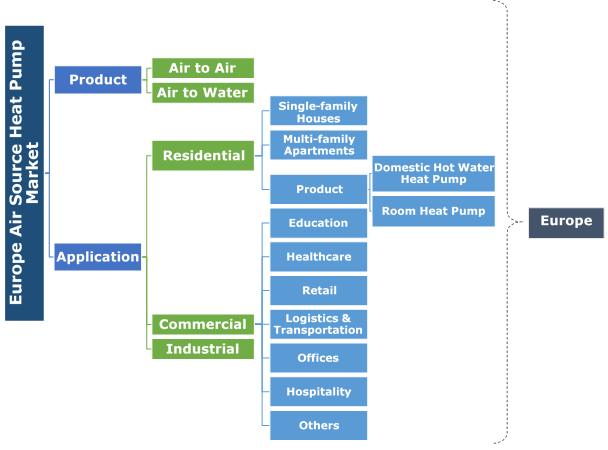 Favorable regulatory regime supported by a multitude of fiscal support schemes and policies will stimulate the Europe Air Source Heat Pump (ASHP) market size. For instance, the 2009 EU Directive on renewable energy sets ambitious target for all the Member States, to attain a 20 % energy share from renewable sources by 2020. The EU directive includes ASHPs within its definition of renewable sources of energy, provided they meet minimum performance standards. Increased demand for space heating across countries with extreme climatic conditions will further augment the business growth in the region. 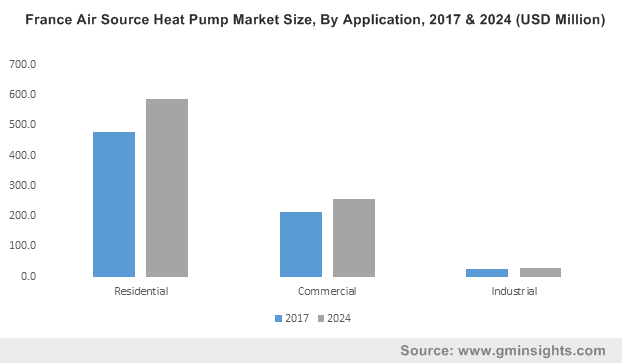 Growing consumer awareness toward energy savings and effective utilization of energy efficient technologies will drive the Europe air source heat pump market growth. The European Heat Pump Association was established as a European Economic Interest Group with an objective to promote awareness and installation of heat pump technology in the region for commercial, residential, and industrial applications. Introduction of stringent targets and incentive plans to encourage the adoption of energy efficient systems will positively impact the Europe ASHP market growth. For instance, the Government of UK introduced the “Renewable Heat Incentive (RHI)” to encourage homeowners to shift from conventional fossil fuel to renewable heating technologies including heat pumps. In addition, ongoing deployment and adoption of sustainable systems to mitigate the adverse environmental impact will stimulate the product penetration. Europe Air to Water (ATW) heat pump market is projected to grow over 4% by 2024. Ongoing technological advancements including ability to automatically adjust indoor temperature and equipped inverter resulting in reduced energy consumption will encourage the product adoption. Ease of operation, low cost of installation and ability to combine with solar heating are some of other prominent features which will further fuel the product deployment across the industry landscape. Cost effectiveness and zero expenses for ground works will propel the Europe air to air heat pump market growth. Simple installation, ability to purify air, high SEER efficiency ratings, and low background noise are some of the key features which will drive the product demand. Commercial air source heat pump market is set to witness robust growth on account of rising investments from public & private financial institutions to upgrade the existing infrastructure. Growing demand for efficient HVAC systems, which can operate with the conventional units in new and existing constructed building architecture will further complement the industry landscape. In addition, the increasing floor space across commercial establishments to provide sustainable heating solutions will stimulate the product adoption. Europe residential air source heat pump market, in 2017 witnessed an annual deployment of over 700 thousand units. Increased consumer awareness to reduce energy bills along with rising disposable income will accelerate the product deployment. Moreover, surging demand for compact and efficient heating technologies driven by introduction stringent government mandates toward energy conservation will further support the industry growth. Italy air source heat pump market will witness robust growth on account of supportive policy framework aimed at maximizing energy efficiency from existing buildings while decarbonizing the country’s energy systems. For instance, in 2016, the Government of Italy introduced Conto Termico 2.0, an incentive policy promoting measures to enhance energy efficiency and the generation of thermal energy from RE. Sweden air source heat pump market will witness growth on account of ambitious legislative focus toward minimizing carbon emissions. The country has pledged to attain its net-zero greenhouse gas emissions target by 2045 to mitigate climate change. The largest consumer group of the Sweden ASHP market include single-family houses, followed by multi-family houses, premises and industries. Increasing stringency of targets pertaining to energy generation from renewable sources along with renovation of existing buildings will stimulate France air source heat pump market growth. For instance, in 2015 the Government of France introduced Energy Transition Bill with an aim of 38% of heat consumption to be met by renewable sources. Notable industry participants operating across Europe air source heat pump market comprise Carrier Corporation, NIBE, BDR Thermea Group, Mitsubishi Electric Corporation, Daikin, Viessmann, Bosch Thermotechnology, A.O. Smith, Vaillant, Panasonic, Johnson Controls, LG Electronics, Samsung HVAC amongst others. Regulatory conformance, cost competitiveness, wide distribution & service network and product differentiation are the some of the key strategic assets for an industry player to enhance competitiveness in the business. Key players are further entailing mergers & acquisitions to reinforce their leadership in the industry. An air source heat pump is a system which transfers heat from indoor to outdoor or vice versa rather than converting it from the fuel. The unit can provide efficient cooling and heating for commercial, residential, and industrial buildings. Lesser maintenance requirement, lower running cost, fewer emissions, and a longer lifespan are some of the other prominent features, which will augment the product adoption.